What are some seasonal activities to do with children in the garden? Just one gourd seed (Lagenaria siceraria) planted in early spring will become a lush, 25-foot vine covered with dozens of gourds by fall. After a full summer of growth, the gourds can be harvested and dried, then turned into natural birdhouses that invite birds into your outdoor space. Growing the gourds is engaging and educational for children as they water the plant and watch it grow from seed. Children can also help with preparing the birdhouses to be hung outside, and the experience truly comes full circle when they observe birds nesting in the houses that they helped to create. Purple martins, Swallows, Wrens and Chickadees will all take to your new creations. Children will enjoy watching the birds gather nesting material, and bringing food to their young as they make your birdhouses their homes. Plant three or four seeds in a slightly raised mound near a fence or trellis so the vines can climb up the structure, off the ground. Fertilize once a week or so for the first month, then all you have to do is water the plants until they are full-size. After the first frost in the fall, cut the gourds from the vines, leaving about an inch of the stem on. After you cut the gourds from the vine, hang the gourds in a sunny spot outdoors. You can punch a hole in the stem with wire and string them up. If any of the gourds get soft and rot, throw them away. A little bit of mold on the outside of the gourd is normal as they drying process takes place. It may take 6 months to dry the gourds. They will be ready when they are very light in weight, and you can hear the seeds inside rattle when you shake the birdhouse gourd. Soak the gourd for 15 minutes in hot soapy water. Scrub in the water with fine steel wool. Rinse it well and allow it to dry thoroughly. To locate the bird’s entrance hole, hold it by its stem between your index finger and thumb and let it hang. Mark a center point along the outermost part of the curve so the hole faces straight out, not toward the sky or the ground. Drill a circular hole between 1 ½” and 2 ½ inches in diameter and sand the edges of the hole smooth. Drill several smaller ¼” holes in the bottom of the gourd so that water can drain. Punch a hole in the neck of the gourd and loop wire through it to create a hook for hanging it outdoors. Let children decorate and paint the gourds before hanging them in your outdoor space. Children painted this birdhouse gourd before it was mounted. 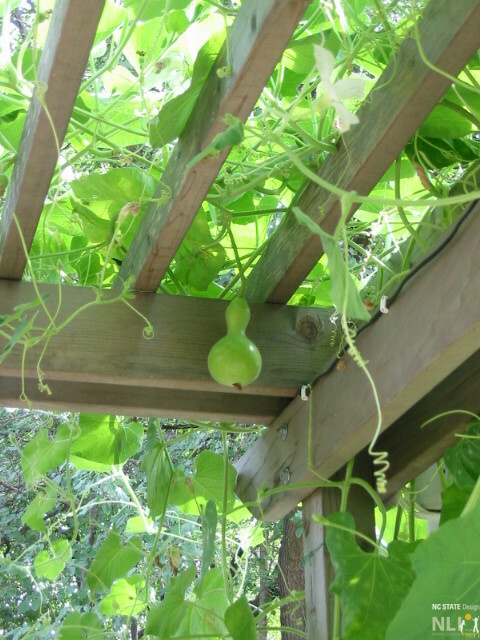 A gourd growing on an arbor – the vines need plenty of room to climb!